It should be Chicken Cacciatore, but I had pork chops thawed so this is what we had. Most meat doesn’t come in packages suitable for 2 people. As I am already buying more than I need I normally buy big packages when they go on sale then divide the lot up and freeze it. I put the chicken / turkey packages in the top drawer and the pork / beef packages in the middle drawer. That way I don’t have to label anything and it just makes life easier. Until they get put in the wrong drawer….. Then it makes life surprising. This was a good surprise. I did something different in this slow cooker dish. I had read, somewhere, that tapioca made a great thickener that could be added at the beginning, rather than at the end of cooking time. I did and it did. 1 cup chopped, peeled tomatoes. Put all of the ingredients, except pork chops, in the slow cooker and stir to combine. Add the pork chops, tucking them into the vegetables. Cook on low for 6 – 7 hours, turning chops once if you can. Today was one of ‘those days’. I’m sure you are all familiar with the type. There was nothing at all wrong with the day. I actually accomplished quite a lot. It just didn’t turn out the way I had planned it. When I walked the dogs this morning it was cloudy and damp. I decided that, rather than work outside, I would spend a few hours working on an art project. After coffee and computer time I went up to my studio. On the way I grabbed the sweater I had started knitting earlier in the week. I remembered that I wanted to check the size against a similar sweater. When I did the comparison I noticed a moth hole in the older sweater. I went to my sewing stuff to look for the yarn to mend it. After a 15 minute search I found it and put it with the sweater. I went in to my studio, turned on the lights and couldn’t see my desk. I put books, papers, pencils, brushes, etc. back into their proper spots. Then I heard the dogs barking to come in so I went back downstairs to let them in. They came in, leaves attached and I realized that the floor needed sweeping. No point in sweeping before I haul firewood so I filled the wood box. Then I swept, shook the rugs and dog beds, and cleaned the ash out of the stove. I was ready to zone out and get into my project. I turned my MP3 player on. I took it downstairs to plug in to the computer to charge. As long as I, and it, were both there I decided to put some new music on it. I couldn’t get the computer to acknowledge that it was plugged in. But I did notice that one partition of my hard drive was almost at capacity so I started a major delete to free up space. At which time the dogs reminded me it was time for their midday walk….. Which, of course, we promptly did. While outside I noticed that my crocuses had all popped up and were blooming beautifully. So I went inside and got my camera. It was time to exercise, have lunch and do this post. On the good news side – my blog appears to be working again…. Any problems? Anyone? Bless the slow cooker! I did pulled pork today. Never thought of pork chops though. These look gorgeous. There are days like this, basically good days even though not as imagined perhaps. 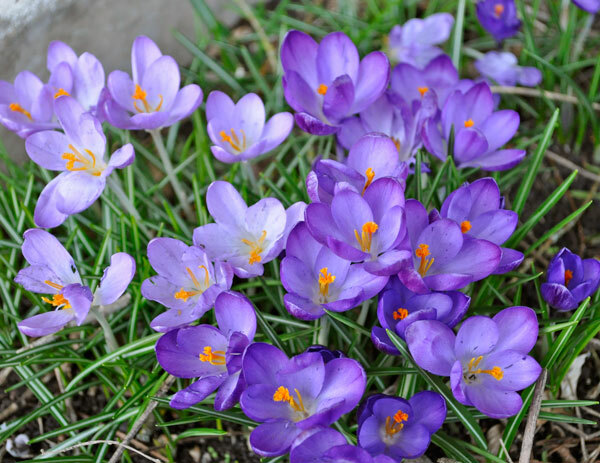 Spring is coming … lovely crocuses. The flowers are electric looking. Gorgeous. 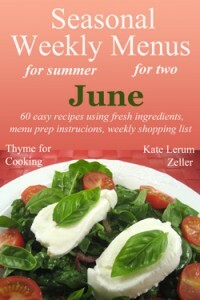 Beautiful flowers, yummy recipe, blog looks great to me. And if it’s any consolation, most of my days don’t go the way I had them planned though that’s not necessarily a bad thing. Just takes me longer to achieve what I wanted to do. And I think I missed a post somewhere, but are you really planning on moving? You’d mentioned something and then I don’t remember seeing anymore. I love surprises like that! 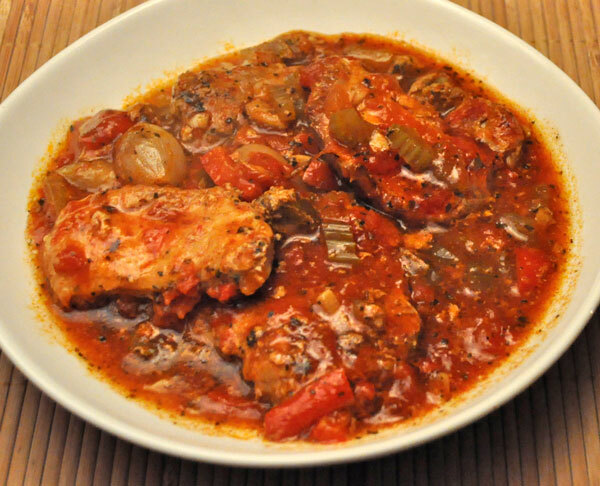 Your Pork Cacciatore looks delicious and delightful. And so do those lovely crocusses. How clever of them to show themselves to you on “one of those days”. I’m suitably envious. Wherever there isn’t snow here, are just bare patches of grey-green grass from last year – no new growth yet. My fingers are crossed that spring will spring soon. Tanna, that’s the only way I do pork chops now – well, in the winter…. nightsmusic, most of my days seem to take off on their own as well lately…. sigh. Yes, we are moving, but who knows when. In the US people are worried if they don’t sell their house in a hew weeks – here, with a big house, we’re thinking a few years lol. Lots of time! Elizabeth, one thing I have enjoyed on this side of the pond is it’s always green… I don’t miss the ugly gray / brown of midwestern springs. Since I never can be bothered with labeling I developed the ‘drawer’ system…. which works about 80% of the time. Close enough.